Phenomenal, this show is the Meta Knight of all animes. What can I say, it has so much ....plot just from twelve 3 minute episodes, not even Clannad can touch base with the amount of themes this show embraces. Betrayal, Loss, Redemption, and just recently 15 seconds of fame. And let me just say, the second episode deserves an Emmy for episode with the most feels ever. There's nothing this show can't accomplish! The only downside of this anime is the fact that its only 3 minutes. This show needs as much air time as Naruto has filler, its that good! And let me just say, this show isn't just for your entertainment...oh no...its moving society forward to innovating ideas. The CG animated ending displays the idea of bringing anime characters to life! Why would we need bodypillows when we could make androids based off of moe characters? Let me ask you all...why are we not funding this??? A Jewel You Should Not Miss! This is a no-miss anime with mountains of great content and A++ acting. Other reviewers have covered the story well, so I will focus on the talent. Of course, Miss Monochrome (MM) is the brain-child of the amazing Horie Yui, who brought her to life on the concert stage and plays her deadpan innocence to the tee in MM's quest for stardom. MM's konbeni-manager turned idol promoter is voiced by Fujiwara Keiji, who many of us loved as Keisei in Shikabane Hime; he is appropriately earnest and bewildered at MM's exploits. The mysterious and selfish Mana is voiced by Kanda Akemi, who I adored as Ooshima Yuuko in AKB0048, while the idol-pinnacle KIKUKO is voiced by the amazing "17 year-old" Inoue Kikuko. This kind of talent is making for a three-minute episode that you wish would last for twenty more minutes. Don't miss a single show! Obviously, I'm horrible at making titles for my reviews, but I just finished Miss Monochrome - The Animation. It took me less than an hour to finish this series. To put it simply, it's a bunch of shorts that I found cute and funny. The goal of Miss Monochrome is simple: become an idol, but she doesn't really want to do any of the work and just wants the fame that comes with being an idol. For what it is, it's fun and I did in fact laugh out loud a couple times due to the ridiculousness of everything. If you have an hour to spare I would recommend this anime if you want something lighthearted and just fun to watch. Too short but sweet! Great ED! Honestly, I think this is where you say, to each their own. I've read some reviews that pointed out specific details they didn't like about the show, but for me they were highlights...or some weren't fans of the humor whereas I enjoyed it. If you think about it logically, the reason behind her actions, it makes sense (well not everything, like losing your fortune, but maybe that's what becoming an idol meant to her). Either way, I think there is so much more they could do with this show. As a short series, I think they produced it really well. I would rate this 4/5 stars but I loved the ED so I had to give it another star. Oh, Loid, help us all! Miss Monochrome is another short anime (4-minutes) with an easy-to-follow storyline and some great gags. Our overly-trusting protagonist is sweet, motivated, and not exactly of genius caliber, an android wishing to become a performing idol. She's got the looks and the voice for the job, but where's that lucky break?! I've only seen the first episode, but this show might just be the perfect spoof for us Vocaloid and Utauloid fans. And did I mention the closing sequence? Watch it once, and I won't have to mention it again! I'll be watching this show--and waiting for her "live" tour dates (need an opening act, Miku?). 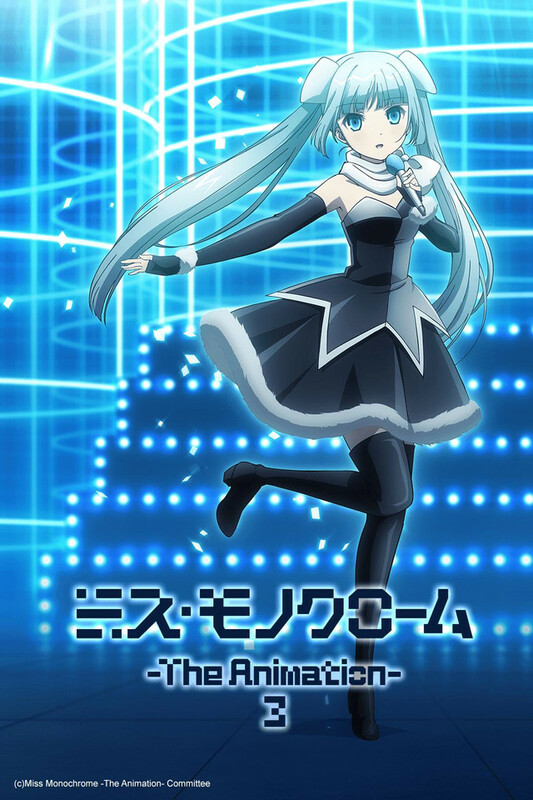 As a fan of vocaloid music I really enjoy the idea of an android musician in real life and watching this series. We get to see her fun antics and listen to nice opening and end themes with the small story line that is needed to follow. Very great show, especially for a short. In short: Wannabe Miku Hatsune. 3 min/ep that will bring you a bundle of laughs. Style: Random pop-culture humor, sometimes requiring an understanding of Japanese culture in order to appreciate the jokes. The ending theme song was perfect - you need the time to catch your breath, and eventually the what-you-once-thought-was-a-weird-tune will have you asking "What are those lyrics anyways?" OK the character's cute and I appreciate the voice modulation of the MC... however it's just... dull. I could not force myself to watch more than 4 episodes before I went back to my queue and deleted it. I was really hoping for more entertainment from something generally highly reviewed, but it just didn't deliver.